IRC conversations do not need fancy layout, and probably not big avatars, but do need color codes. In the mockup above, I've added color codes for your own name (to tell apart your own sentences from others) and when someone mentions your name. Status messages are gray. > your own sentences from others) and when someone mentions your name. Yeah, I was thinking that too at first, but I'm not really sure how much value that actually adds and if it's actually just adds noise to the conversation. If we only use it for your own nick and when people message you, we would get more out of the color coding, since those two are more crucial, especially the name highlight. I generally find it really difficult to follow an IRC conversation without color. Color is an important piece of information that quickly lets you discern patterns and group messages together. > crucial, especially the name highlight. Colors are very very useful, they make the conversation readable, it's definitely not noise. I think it would be very useful to have a color for each nick, based on the colors in the list of participants. When it comes to highlighting a message which mentions your name (or a searched word, or a permanent search - I thnk Instant Bird has this but not sure TB), maybe you could mark the word in bold + some sort of background for the message. Otherwise, I really like the compressed layout. good job! All right, colors it is. I'll update the mockups and start the implementation. As I understand this bug, this new layout should only be for IRC? If yes and if this should be done through CSS we need a selector like #Chat[account="IRC"]... to apply this only for IRC. Maybe this could also help for other accounts in the future to style account specific things. I don't know how many different colors are used but this would need for every known color such a rule. I think it would be better to change the logic for the, on TB unused, sendercolor to style directly the color for .sender. This would then also work on other accounts. Hm - DOMi isn't showing me anything that Richard could use as a selector to make IRC conversations distinct. Is there something we could use that I'm not seeing, or do we need to special case IRC conversations somehow? > not seeing, or do we need to special case IRC conversations somehow? So there's currently no way of special casing a conversation like this via the Adium message style API we implement (see ). It should be possible to modify fairly easily I 'pose. would need to add the protocol ID so it's available in the message style. That method seems to have a conversation as an input...so it should be possible. > the Adium message style API we implement (see ). You can just move the %sendColor% replacement in Content.html and Context.html to wherever you need it. Florian, thank you for the tips. On the contrary to the mockup every message is in their border. This is because the IRC attribute is on every message and not global and the events have no attribute and the topic could be never differently styled. But with this patch the IRC don't look fully different to the other protocols. I gave the nick names a maximal length of 100px. Longer nicks have a ellipsis (crisccoulson is fully shown but on the limit). I can't do this width dynamically because of the structure of this messages. After the patch upload I tried it with live IRC and found the attribute has changed from "irc" to "IRC". This patch checks now both (historic conversations are using lowercase and live uppercase). I also removed a calc() because TB 15 and 16 knows only -moz-calc(). With the again smaller font for the pseudo where is also no calculation needed. The pseudo is now centered to first line's text. This looks like a giant step forward to me. I do wonder if we should do everything like IRC, and only have Twitter be the different one, but I'm going to say ui-r=me, and we can fix that later, if other people agree. I tested the patch. To compare, I took a screenshot of the same conversation both with and without the patch. One of the goals of this bug was to reduce the wasted space so that more messages could be displayed at once, which is especially important on IRC as busy channels may have lots of messages arriving quickly. The patch seems to improve things a bit for this situation as there's one more line of content displayed with the patch, but I think we can still do much better. - reduce the spacing between the text of system messages and their borders. - Without the patch it seems the second line of text can go under the time stamp (not very visible on my screenshot), with the patch it doesn't, this creates a blank column on the right side and the timestamps end up taking a lot of space. - I'm not a fan of the column on the left side for the nicknames that also takes a lot of space, but that's a bit a matter of taste as I know some people would like it. I discussed this bug with florian on IRC earlier and it feels like in order to get this bug right, we need to get rid of the bubbles since it's eating too much space. I'm going to create a patch that reuses a bunch of code from the Instantbird theme Simple and will aim at something that is closer to the initial mockup. Still need to figure out what to do in the Twitter case, since I agree that's the one place where we need avatars for sure. Patch in progress. Some stupid alignment issues still, but totally usable. Blake suggested doing double twitter messages as one, but I'm sceptical to that as each little tweet is it's own thing, so I ended up not doing that. Still does some ugly overflow if your irc nick is too long, but apart from that all should work well. I added a overflow and ellipsis to the sender name and gave a 3px gap to separate the message. What I'm seeing always after the messages is the .lastMessage with the accumulating elapsed time I'm connected. Shouldn't this only show the time since the last message? > since the last message? I think this code is based off of (Time) Bubbles from Instantbird, which shows the elapsed time between any two messages (that is over 5 minutes). It doesn't look like that part of the code was changed (comparing  to ). Sorry to spam this bug but the in my last patch added span isn't needed. The '#chat .pseudo' is enough to override the '#chat *' overflow rule. So my change is only in CSS. Getting closer, but not quite there yet. The usericons need explicit width and height, I think. It looks like the first line is wrapping incorrectly. We should do something better there. 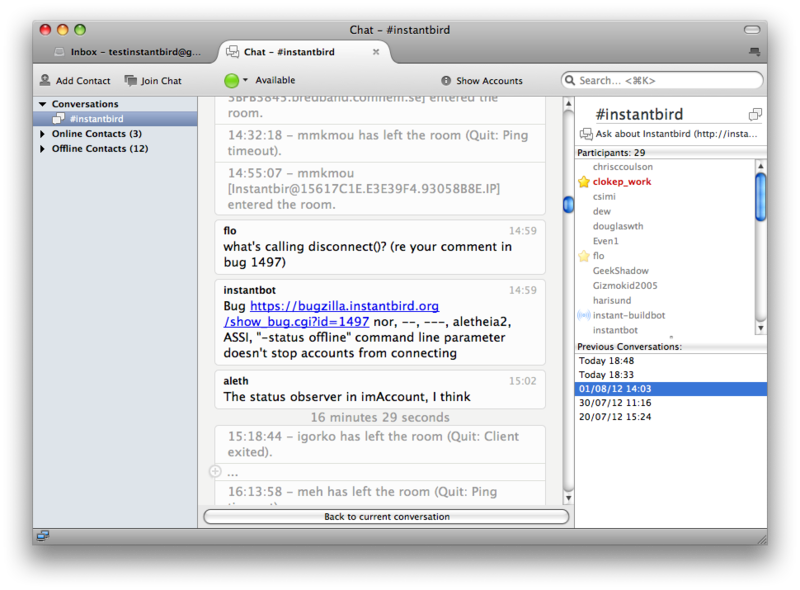 4) The "12 minutes" at the end of irc channels should be a lighter shade. Perhaps use the one from the timestamps? For that matter, what is that 16 minutes anyways? Should we just hide it for IRC? Could we get some colours that aren't yellow? I have no idea what happened here, but that's terrible. Okay, okay, I've complained a bunch, but I want to end off by saying that I really do like the new style, and am looking forward to ui-reviewing the next version! > Getting closer, but not quite there yet. >    The usericons need explicit width and height, I think. Fixed, it looks like Andreas planned for Twitter the old behavior of pseudo/ date on first line and text on second line. It works now like this. > 4) The "12 minutes" at the end of irc channels should be a lighter shade. > Perhaps use the one from the timestamps? Gave the same color as on old theme and centered it. It looks now it shows the time since connect. Before it showed the time since the last message. >    Could we get some colours that aren't yellow? >    I have no idea what happened here, but that's terrible. Could you check with DOMi what happened? I don't know when each one is used of this two files. I haven't been able to duplicate that behaviour, but I'll do some more testing and see why that is. This patch should address all issues except the sender color (bug 783759). I'll let Andreas test this patch before I'm asking for review. This patch is using again the class bubble and the HRs to be compatible with the JS making the lastMessage and the show/hide events. I think it's better now to play with CSS instead of changing the JS and maybe introduce some regressions when TB15 will be released in some days. If needed this can be changed in later versions. No negative feedback from Andreas so asking for review. The only change to previous patch is hiding the interval messages. This includes the lastMessage. Marking as review minus as we have newer patches. Also, attachment 653076 [details] [diff] [review] and attachment 653046 [details] [diff] [review] are identical. As I wrote, because TB15 will be made tomorrow I don't want to introduce regressions. > [details] [diff] [review] are identical. Correct, I'll add the right one this evening. Keeping JS code that calls scrollIntoView on an element that you are hiding seems quite dangerous to me ;). > seems quite dangerous to me ;). You know the code best. Could you remove it, then we are sure the correct code is removed? > > seems quite dangerous to me ;). Yes, I'm going to attach a patch soon. I'm reviewing the CSS code in main.css now. - Removed the <div class="message"> and <span class="message"> elements that were redundant with the <span class="ib-msg-txt"> that's already added by imThemes.jsm. - Removed the rules related to the .action class that were left overs from the Simple Instantbird theme, and are now irrelevant. - Avoided the expensive descendant selector wherever possible. If we weren't so close to releasing, I would also try to get rid of the hr tags that are currently hidden, but still referenced by some JS code, and I would try to get rid of the "p.event" override for a rule in ".event" (Both of these things are leftover from the Bubbles theme from Instantbird). But as we are running out of time, I think I'm done editing this and it should be ready for review. Works most excellent! We can file followup bugs about the remaining issues. Removed leftover time= attributes in Status.html and NextStatus.html, and fixed the Context.html file to match Content.html + the "context" class. From what I've seen so far, I like it. ui-r=me, and even more so if we show the username on all irc actions (as discussed in irc). Just changed the .next selector to message:not(.action) > .next to display the username on all action messages (as mentioned in comment 52). Attachment #653377 - Flags: review? Drive-by - just a few comments / questions. I'd prefer if this was formatted properly, as opposed to a single line. Or are we optimizing for something here? These need to be indented properly. Hrm. So, in some cases, %service% will get passed twitter, and other times, it's passed Twitter? > are we optimizing for something here? This line will be parsed and inserted in the HTML document once for each message, so avoiding the whitespace saves a significant number of DOM Text nodes. I'm not sure if it's a significant memory saving or not. > These need to be indented properly. What's wrong with the indentation? Or do you just mean you would like spaces instead of the tabs? It will be Twitter for ongoing conversations and twitter when displaying a logged conversation. The problem is that the only value that is stored in the log files is account.protocol.normalizedName and getting the protocol's name from the protocol's normalized name isn't easy. - call toLowerCase in the service: function of imThemes.jsm. This isn't a correct fix as there's no guarantee that the normalized name is just the lowercase version of the name (the name is intented to be displayable for the user. For example for Google Talk the name is "Google Talk" and the normalized name is "gtalk"). It would be enough to simplify our CSS here though. - a "fix" could have been to store the protocol name in addition to the normalized name in the meta data of the logs, but I'm afraid it's too late for that, as there's already been several betas producing logs with protocol name. Hm - I'm seeing some formatting weirdness in some cases on Windows 7. Note that the smiley bug only seems to appear if the smiley is by itself. If the smiley appears after text, the bug doesn't manifest. This should fix the issue reported in comment 56. Thanks for catching this Mike! Attachment #653400 - Flags: review? > > These need to be indented properly. > instead of the tabs? > > it's passed Twitter? > protocol's normalized name isn't easy. For what it's worth, this patch looks pretty good to me. Same patch without the tabs that Mike disliked. This patch has already been reviewed by Mike and me, and ui-reviewed by Blake. Attachment #653468 - Flags: approval-comm-beta? Attachment #653468 - Flags: approval-comm-aurora? Is there any problem to put the older theme in Gmail conversations? > Is there any problem to put the older theme in Gmail conversations? Not for this release, but I suspect someone (Florian, perhaps?) could release a theme add-on which was more in the previous style. 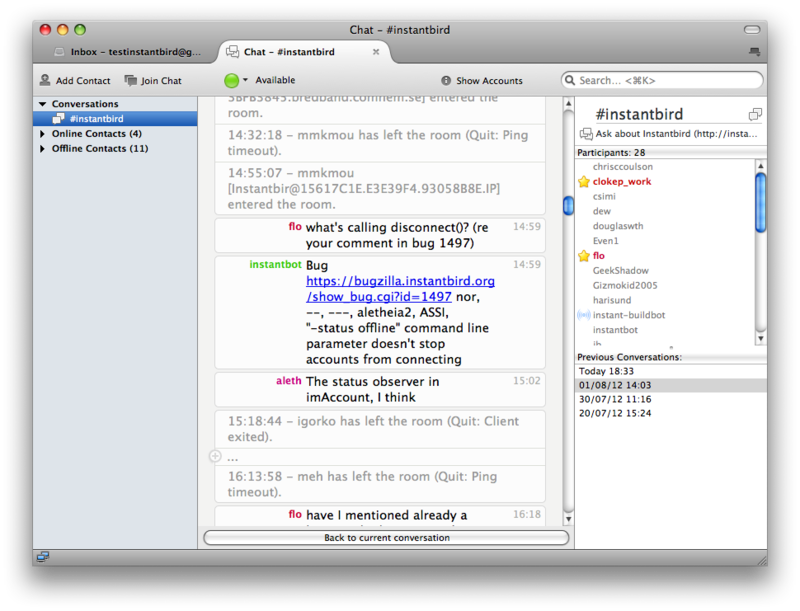 Maybe it also helps to know that Instantbird (the program that Thunderbird got its instant-messaging core from) offers a wide variety of themes at http://addons.instantbird.org (in category "Message Styles") and might have something (maybe different but also suitable) for you. Once you picked the theme you like, we can guide you through making it compatible with Thunderbird. (Easiest thing to try different themes will be to use Instantbird for that, since it has a preferences page to manage both message style- and emoticon-themes). > > Is there any problem to put the older theme in Gmail conversations? Ok, i'll get one in the day, but i'll need help because i never worked on thunderbird add-on. Yesterday i took a look at the package .xpi of a theme and it seems to be easy to understand, but i need to know what to change to fit the new instant messaging core. Thanks for your help, maybe you can contact me by mail for that, it doesn't need to be on the bug tracker because it's not really related to that bug.